Boat season is quickly approaching! We have almost made it through the time of the year where those individuals that love to spend their days out on the lake are stuck inside waiting for the cold weather to go away. Minneapolis, MN has its fair share of cold weather, so the thought of getting back on that water puts a big smile on peoples faces! When dealing with boats, it is important that you start off the lake season with a boat that has recently had a tune up. Additionally, if you finished off last boat season with some nicks and damage on your boat, there is still time to get it fixed before it’s time to hit the open water! Team up with Anchor Marine Repair for all of your boat collision repair needs. Not only do you get to work with Minneapolis’ number one boat repair shop, but you also get a dedicated staff that is committed to repairing your boat to better than pre-accident condition! Our team has a true passion for boats, which you can see from the combined 45 years of boat repair experience on staff. With Anchor Marine, you get a one stop shop for all things boat repair! Top Notch Facility – On site, we have 2 buildings that combine to provide 10,000 square feet of work space. Additionally we can work on boats up to 38 feet in length. Not many in the industry can say that! Pick Up and Delivery Service – Don’t let the distance be the reason you decide not to get your boat repaired. 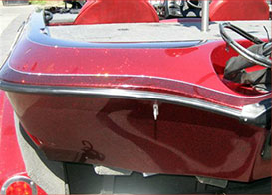 A boat is quite an expensive investment, so it is important that you take the necessary measures to get the collision work done on your boat. Our team makes it easy for you! We will pick up and deliver your boat from your home or dock as long as it is within 250 miles of the Minneapolis area. So, before the warm weather gets here for good, make a call to Anchor Marine Repair for all of your boat collision repair needs. If you live in Minneapolis, MN give us a call today at (763) 972-3540 to learn more!